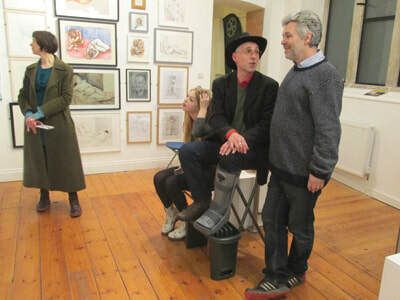 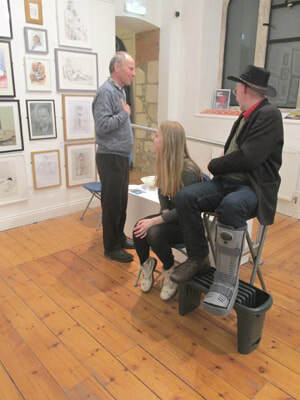 Expressions was the sixth Stroud Life Drawing group exhibition and, for various reasons, the most memorable so far. 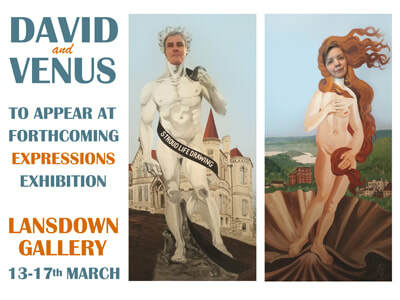 This annual show provides some welcome punctuation in the drawing calendar. 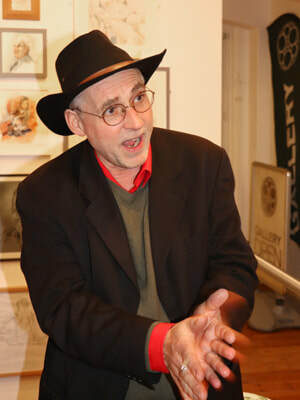 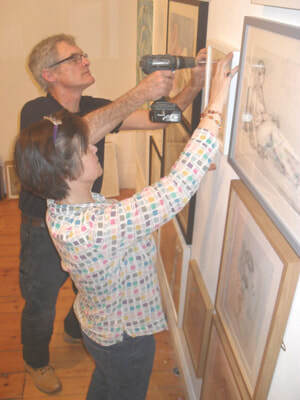 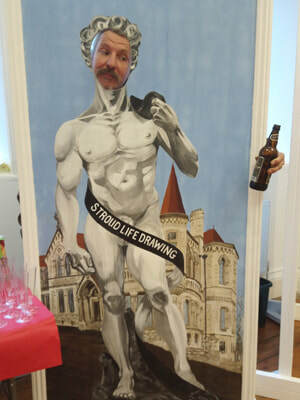 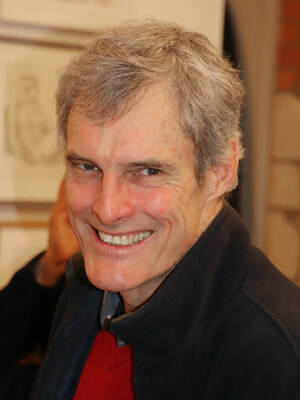 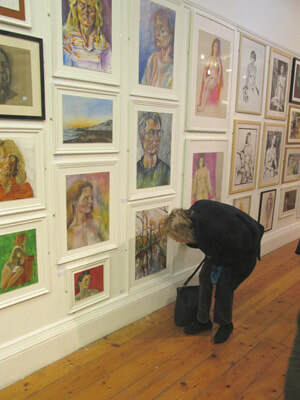 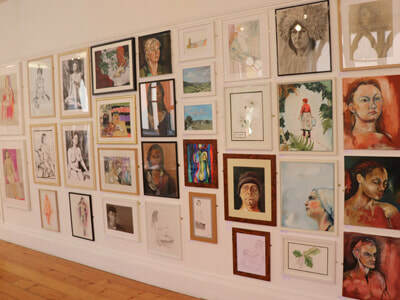 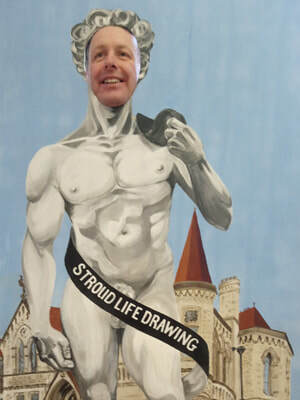 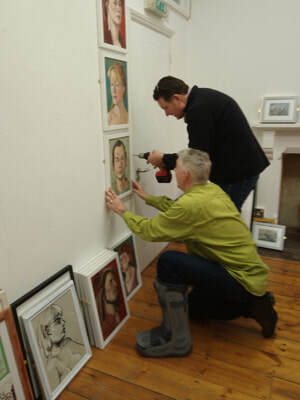 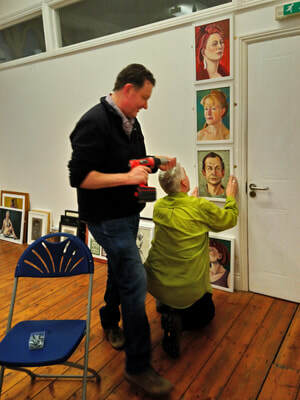 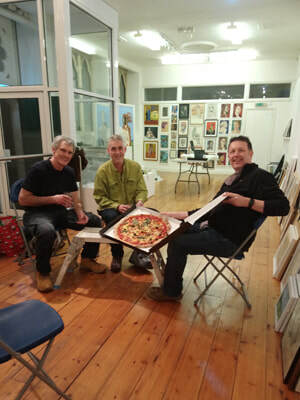 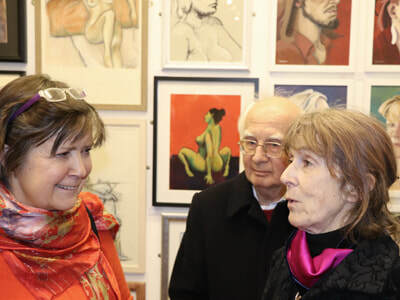 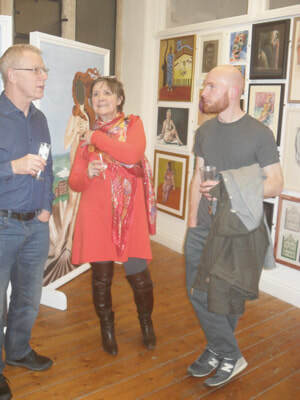 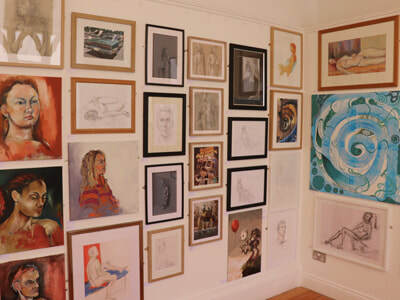 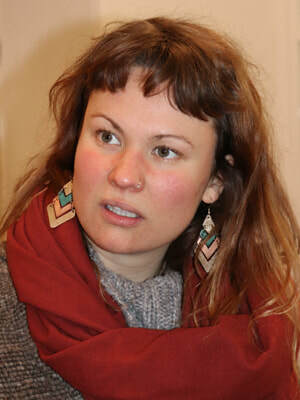 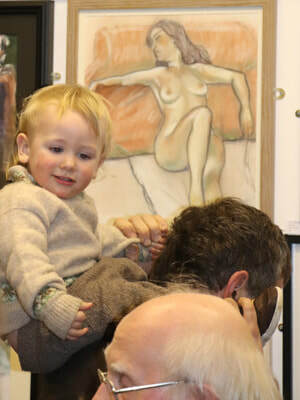 It also gives all those people who attend Stroud Life Drawing’s regular sessions a chance to dust off some of their best work and hang it on the gallery walls in a shared spirit of success and celebration of achievement. 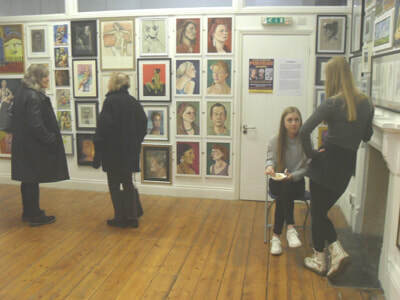 As in previous years, many of those people showing their work had not exhibited anything before and it was great to give everyone the opportunity to participate. 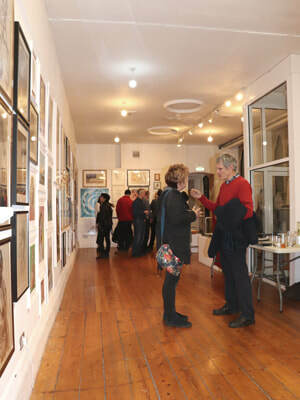 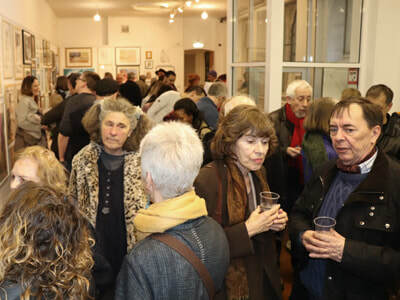 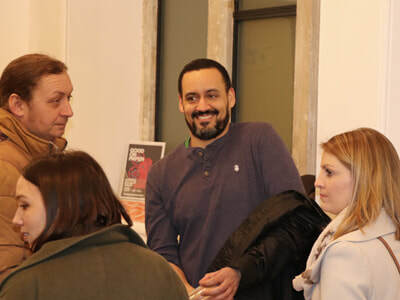 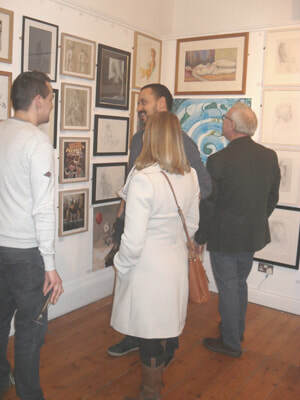 I was delighted with how such a diversity of artistic experiences, styles, subjects and sizes hung together as a cohesive group show with everyone’s work valued as an integral part of the whole and as a personal record of individual creativity. 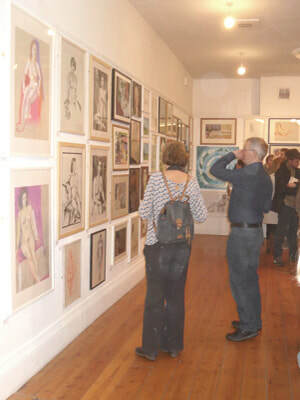 As several gallery visitors noted, the standard was high enough to have graced the walls of many a London gallery and this is borne out by the photographs on this page. 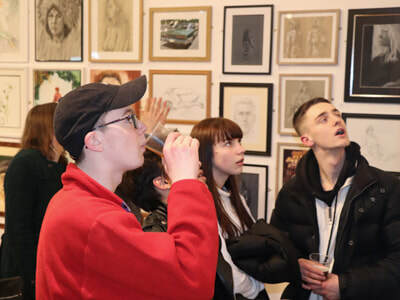 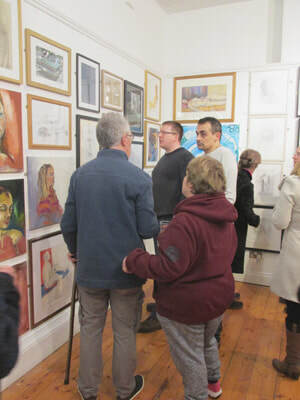 As would be expected, life drawing with pencil, pen or charcoal was well represented but artists were again invited to include the other types or work which they do, making the show hugely varied and interesting. 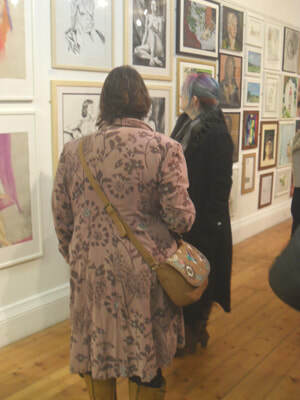 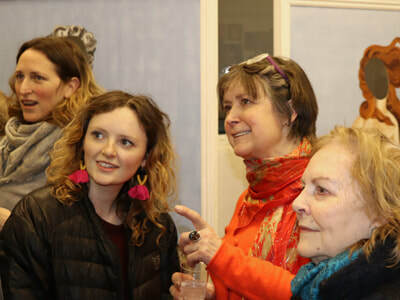 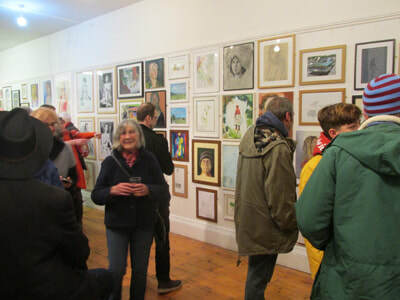 As always, it was great to see so many Stroud people, including some of our valued models, coming in to have a good look around and to spend some time appreciating the art on display. 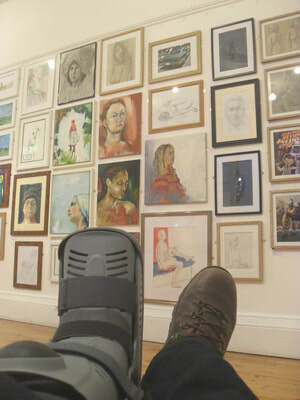 It was with some relief on my part that Expressions went ahead at all this year as, with impeccable timing, I broke my ankle just days before the very physical task of getting so many pictures into the gallery and onto the walls. 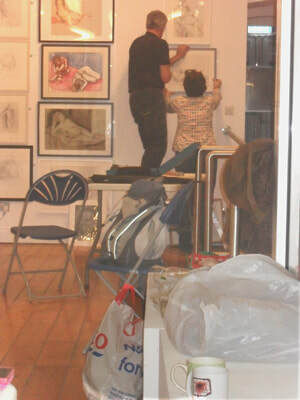 It only happened through a great team effort and ‘the show must go on’ sense of triumph through adversity! 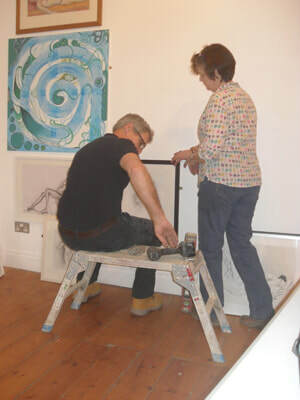 Special thanks must go to Helen, Simon, Liney, Jerry, Ruth and Pam who all gave of their time to support me in my hour of need as, in fact, they usually do! 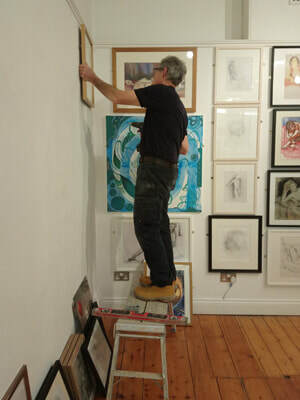 Simon, you are some hangman and pretty nifty with the filler too! 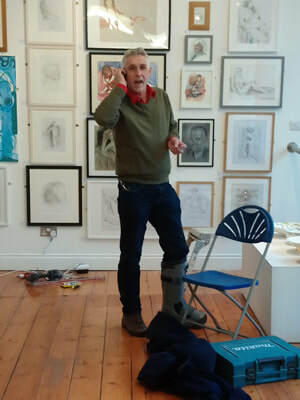 Jerry, your daily lifts to and from the gallery when I was so incapacitated were appreciated very much. 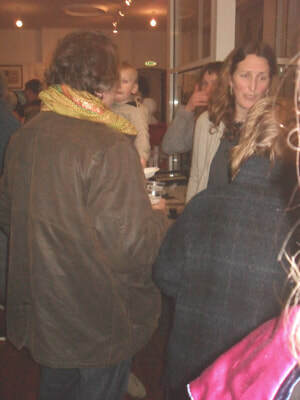 Thanks are also due to the army of potential helpers whose kind offers of support were only declined because too many cooks may have spoiled the broth. 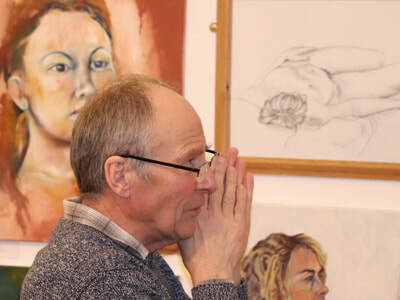 I felt quite overwhelmed by help, sympathy and genuine warmth coming my from the life drawing group and I feel this speaks volumes about what a very special art group we have established together at the Centre for Science and Art. 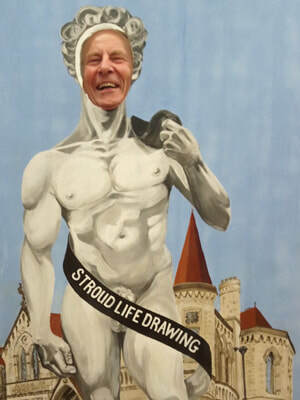 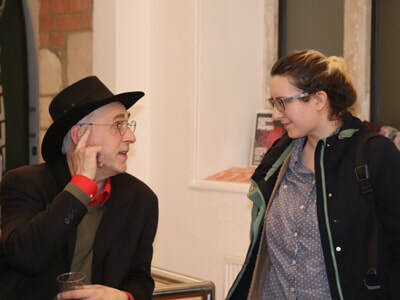 It is thanks to all of you that Stroud Life Drawing is the friendly, welcoming and supportive creative space that it is; without you it does not exist and without you submitting work for the exhibition, it cannot happen. 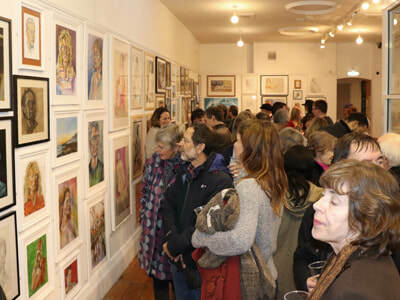 Thank you to everyone who helped out and thank you to everyone who turned up on a cold and snowy Sunday morning to collect their work from the gallery. 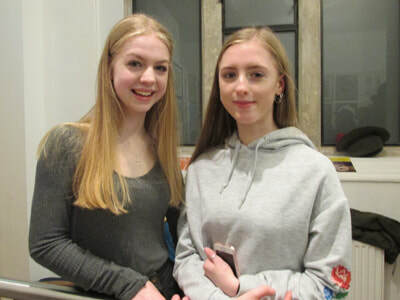 We were fortunate that Expressions fell between two heavy falls of March snow as it could so easily have been cancelled if the dreaded white stuff had fallen differently. 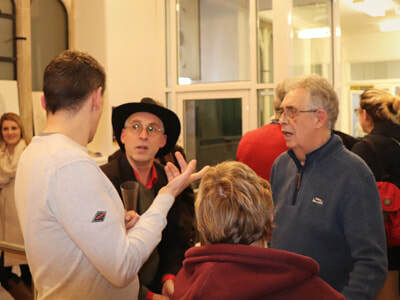 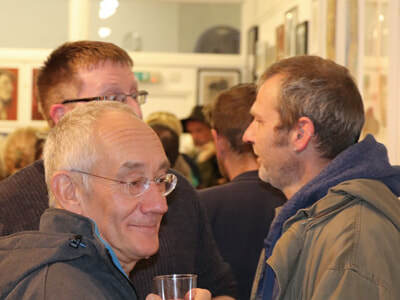 Most of the photographs on this page were taken by Jerry at the very busy and buzzy Private View which, I must admit, I enjoyed a whole lot more than I thought I would. 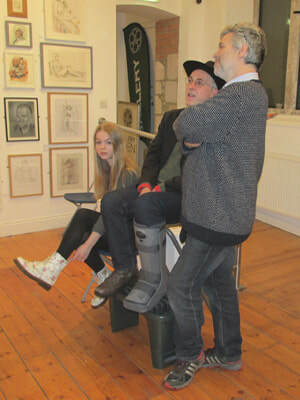 Despite being pretty much fixed to my chair all evening, the pleasure of seeing so many friends turn out on a Monday evening completely took my mind off the ankle injury. 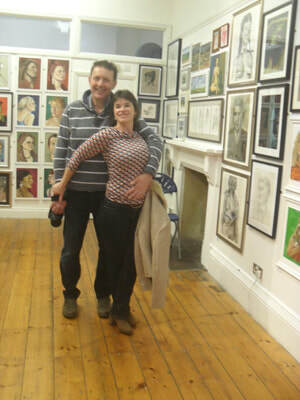 Although they were not able to stay long, it was particularly pleasing to see Louise and Simon - thanks for making the effort. 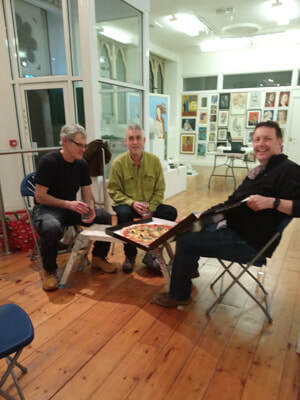 It was also pleasing to see Ben and Henry, two Marlingtonians, one of whom I had the privilege of teaching during my time as an art teacher at the school. 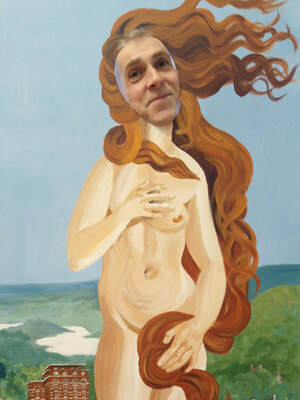 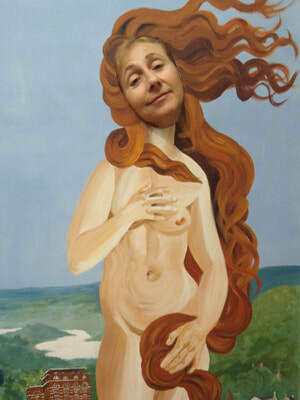 The skilfully made selfie-boards of Michelangelo’s David and Botticelli’s Venus came courtesy of Caroline. 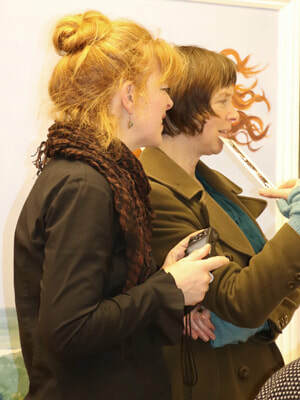 Specially made for this exhibition, they were great fun and can hopefully be used again and again at various events and summer fairs. 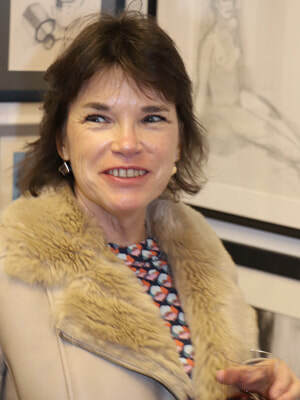 Thank you Liney; you are one of the many group stalwarts and you deserve the great success that you are enjoying with the development of your painting and drawing. 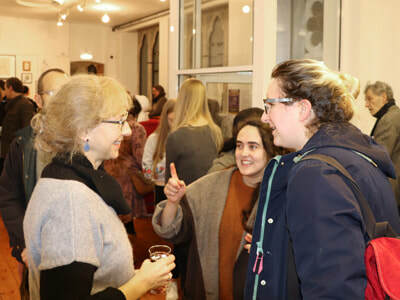 Indeed, the significant improvement in everyone's work is the mark of this year’s show and long may such personal develop continue. 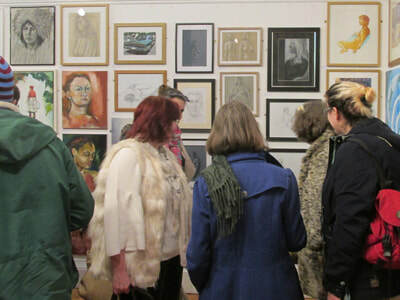 There were simply too many pictures in the exhibition to comment on everyone’s work but Michael’s large scale charcoal life-studies, along with Ruth’s two pastels, made a great central focus to the main gallery wall. 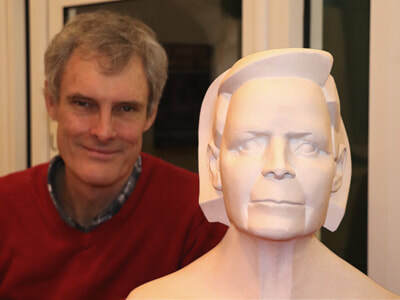 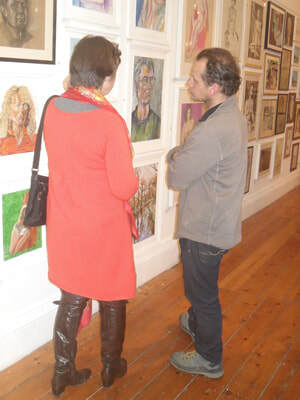 Simon’s excellent acrylic paintings were much admired during the week, as was his portrait bust. 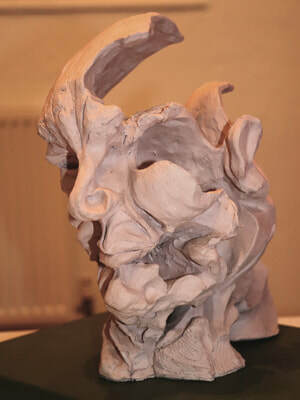 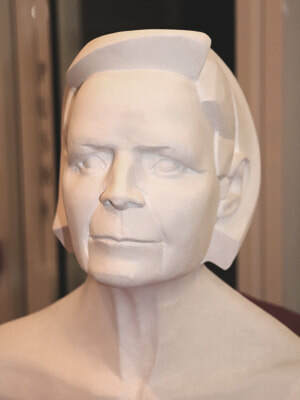 Other notable 3D pieces were Jenny’s inside-out face and Pam’s stone carving of multiple figures. 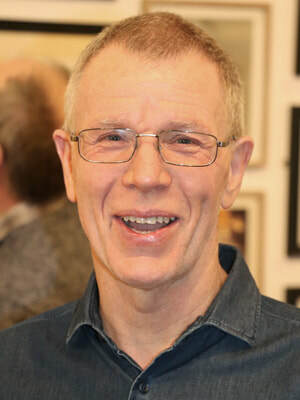 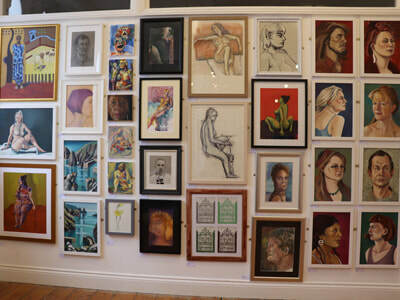 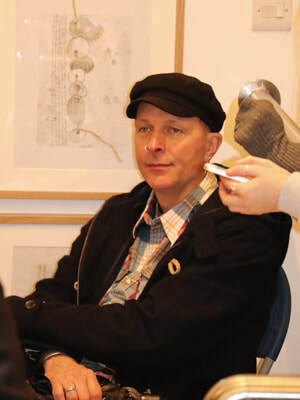 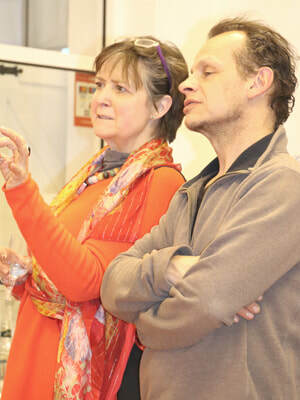 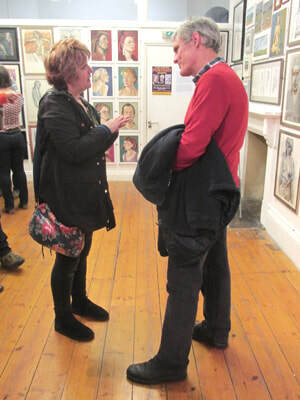 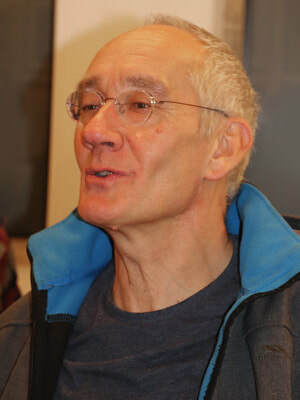 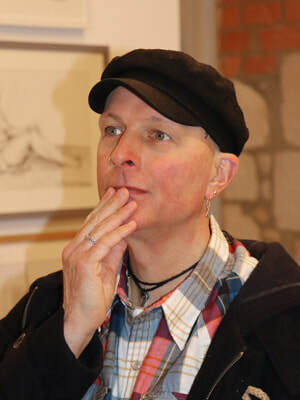 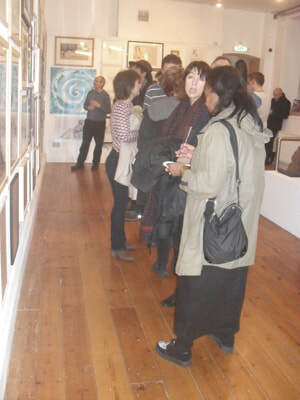 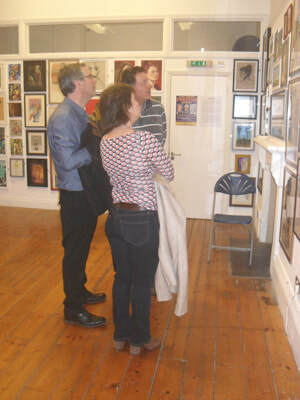 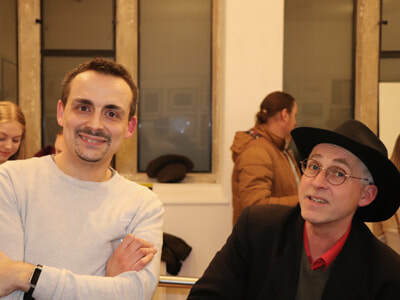 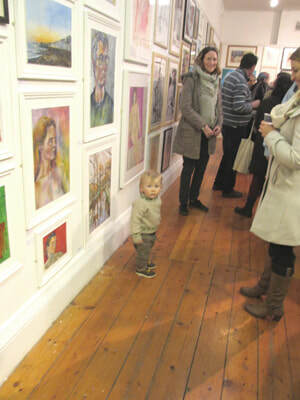 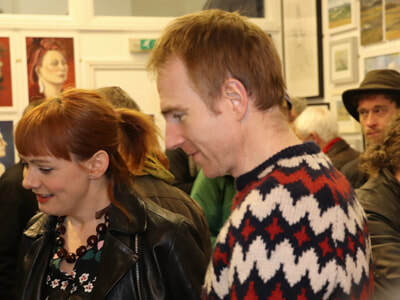 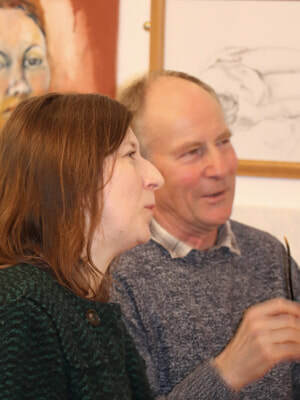 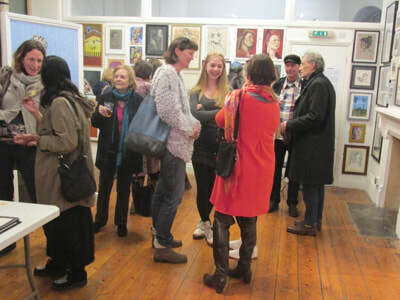 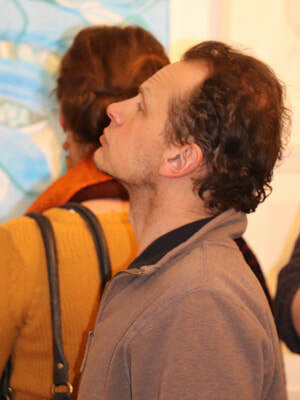 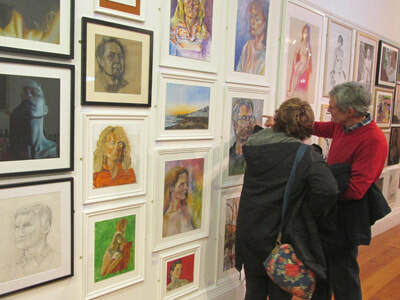 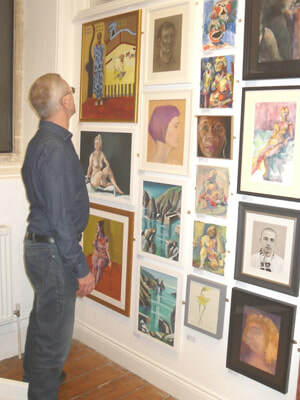 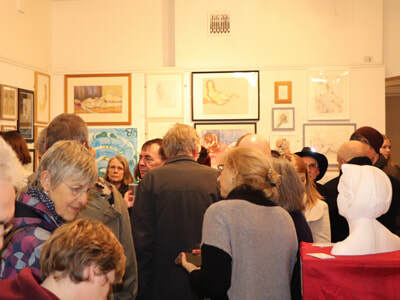 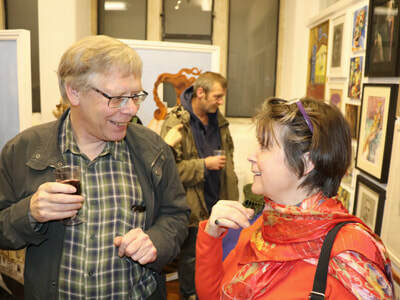 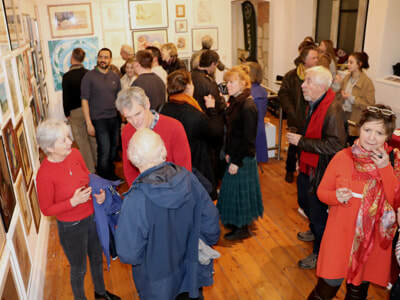 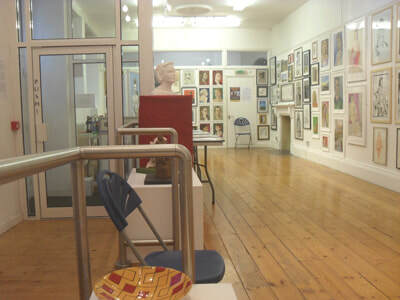 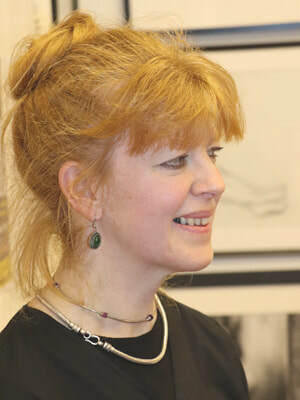 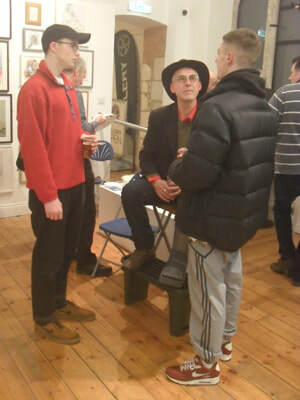 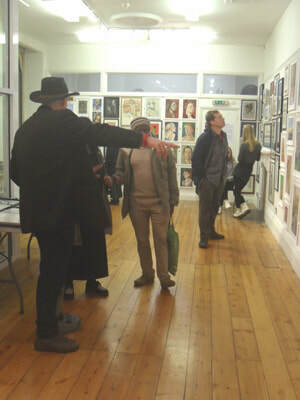 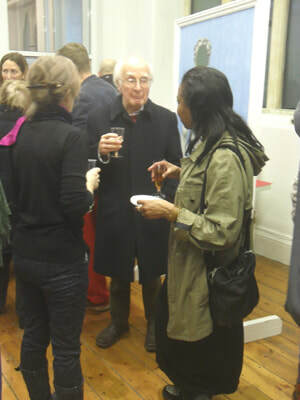 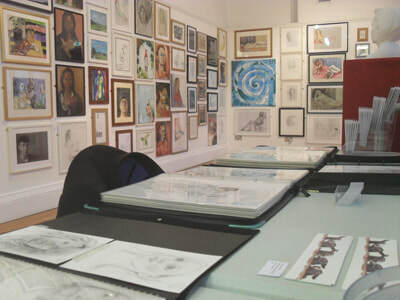 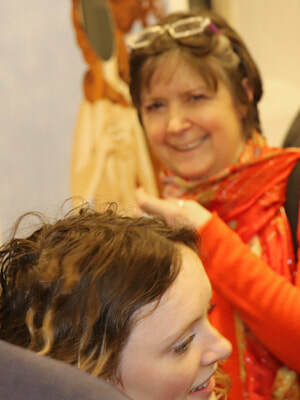 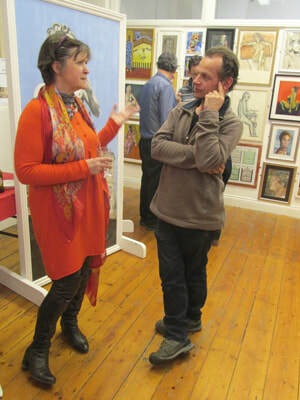 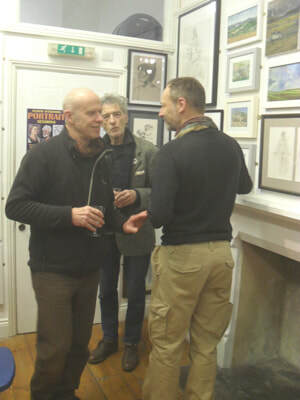 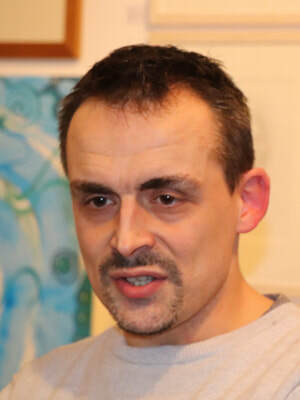 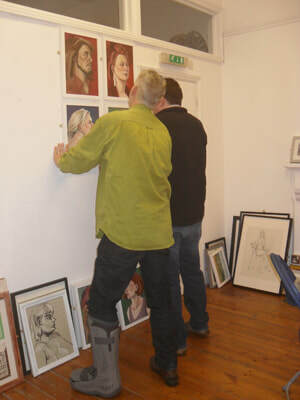 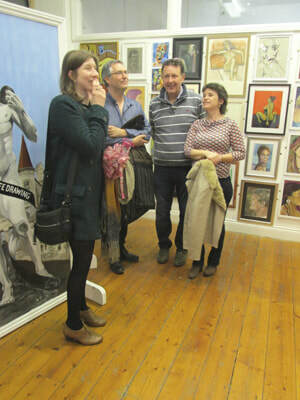 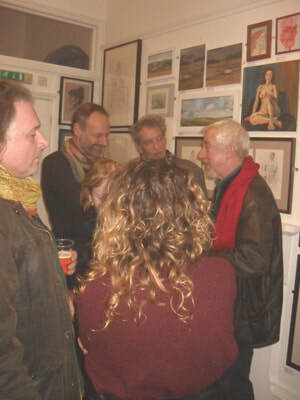 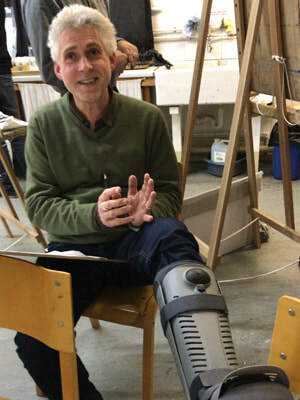 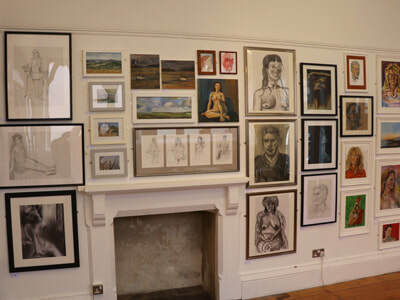 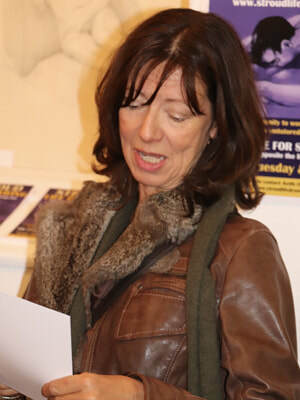 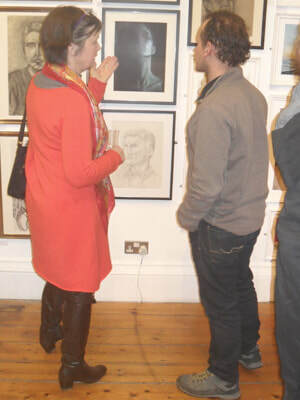 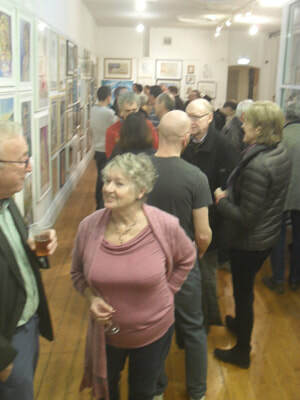 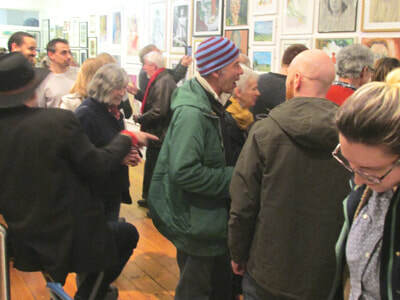 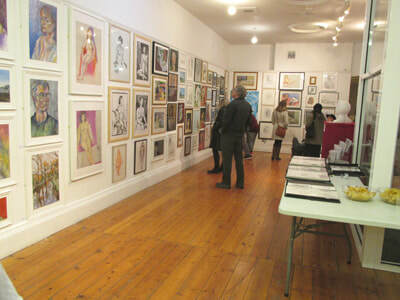 Both Nicola and Colin were first time exhibitors with Stroud Life Drawing and their work was admired by many visitors. 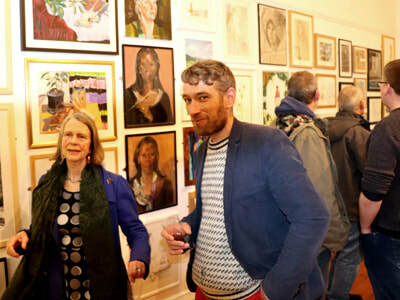 It was a privilege to honour the memory of talented artist Jane Tudor by including her exquisite drawing of Chris Richford. 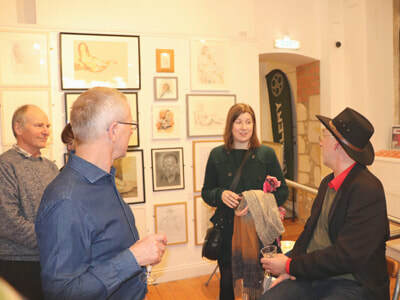 I was pleased that Jenny Sutton again entered three of her assured life drawings as well as some interesting mono-prints. 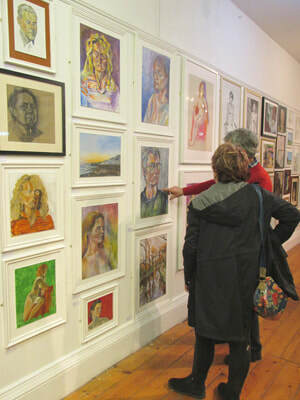 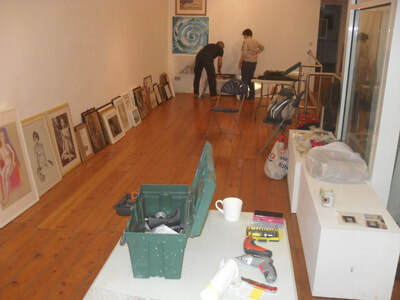 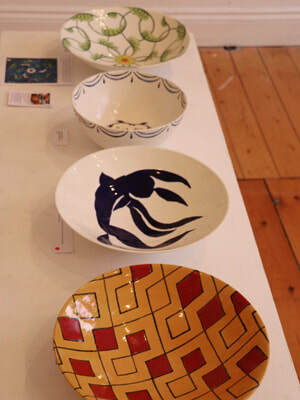 Small gems included Pat’s watercolours, Emma’s life drawings and gouache animals, Lee’s landscapes and Louise’s oils. 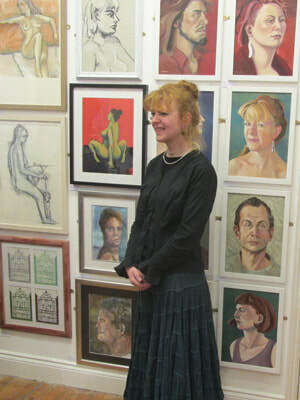 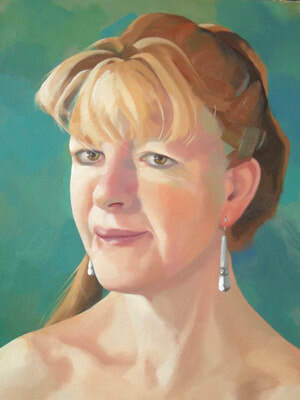 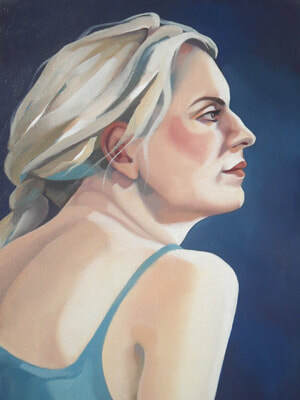 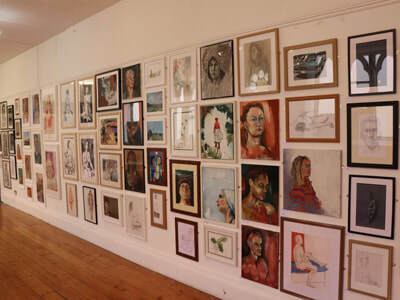 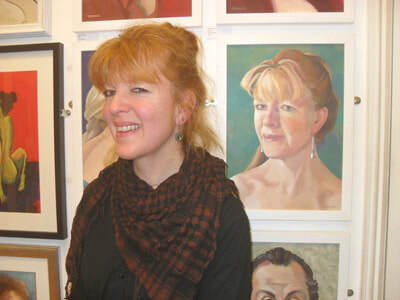 It was also great to have some of Corinne’s superbly painted portraits and self-portraits in the exhibition. 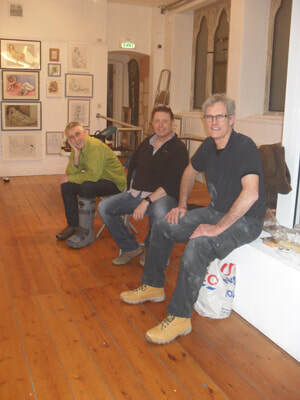 Rebecca, Steve and Ewen go from strength to strength with their work I am confident that their determination will yield further success with painting and drawing. 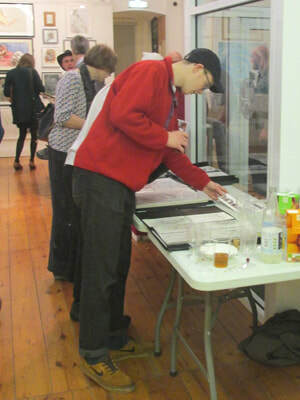 How awful of me not to mention everyone’s valued contribution but please forgive me as I am already far too verbose!